Ever since the Web became popular in the 90s people have been struggling with how to make money using the Internet. Even today, angry investors of Facebook clamor to see results. For a company with a billion users, you’d think they would make more money or could easily monetize their base. Often, Internet businesses are not easy to monetize like an ice cream shop. Investor Warren Buffet loves ice cream shops because they are easy-to-understand businesses with a simple business model. I want ice cream. I have cash. I give it to the ice cream shop. They give me ice cream. Getting people to part with their money online is much harder. What Works as an Online Business? Few universal shopping carts exist. Online advertising rates are going up and proving less effective. Where do you go to find out what really works as a business idea? Enter Flippa. 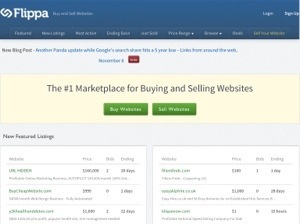 With Flippa you can browse a list of websites and businesses for sale and see their ways of making money along with their traffic. Website sellers post their Google analytics reports as well as other documents to showcase their business model. The Google analytics reports demonstrate actual numbers for the business. You can see if the business has legs and what the potential opportunities are for that niche. I was amazed to see how many popular topics niche businesses gained Facebook likes. A very basic coffee website gathered 8000 likes with no curation of content or activity on the Facebook page. The site made some money selling ads next to articles about coffee. Another website made money posting jobs online. Simple businesses that Warren Buffett would approve of. I love Seth Godin and his advice. I enjoy watching his videos on YouTube. He really gets the new economy. The safest thing to do now is be risky and start an online business.